1. The var iety of fescue seed in the bag and percentages. 2. Percent of germination, which is how much of this seed will actually grow. 3. Crop seed, which could include seed such as ryegrass, bentgrass, bermudagrass or orchardgrass. Some (like orchardgrass) are very difficult to control. 4. Inert matter, which is other “stuff” such as soil. 5. Weed seed (noxious), which may be impossible to get rid of without killing the turf. If you compare labels, you’ll understand why we always recommend Gard’N-Wise Premium Tall Fescue Blend. 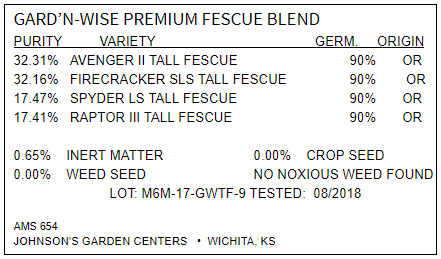 For starters, this blend uses only fescue types that have been tested in Kansas and are the best available for this area (the types may change due to availability and continued testing). Other brands of fescue blend use the lowest cost fescues available, and chances are those types don’t test well in this area. Gard’N-Wise Premium Tall Fescue Blend also has a high rate of germination, and virtually no weed seed. 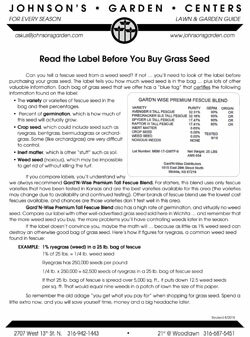 Compare our label with other well-advertised grass seed sold here in Wichita ... and remember that the more weed seed you buy, the more problems you’ll have controlling weeds later in the season. If that 25 lb. bag of fescue is spread over 5,000 sq. ft., it puts down 12.5 weed seeds per sq. ft. That would equal nine weeds in a patch of lawn the size of a piece of paper (8" x 10"). So remember the old adage “you get what you pay for” when shopping for grass seed. Spend a little extra now, and you will save yourself time, money and a big headache later.